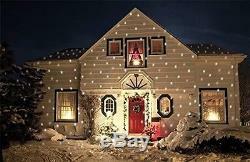 Falling Snow Flakes Light Projector Led Flurries Outdoor Christmas Show Decor. Only Few Left in Stock! This Amazing Falling Snow Flakes Light Projector will totally enhance your Christmas Outdoor Decoration! Light Flurries turns your existing holiday decorations into a virtual animated winter wonderland. Light Flurries works on simple AC power. It's a lightweight and easy-to-use device that will cast a breathtaking show, cascade of snowflakes on your home. Just place the weather-proof unit outside the home and watch it snow. You can adjust how hard it's snowing by turning the speed dial located inside the cabinet. By adjusting the angle of the reflective components you'll achieve different visual effects on your house. Perfect for all climates Projects "snow" over 60' wide and 40' high ETL certified Weather resistant 12V AC power plug. 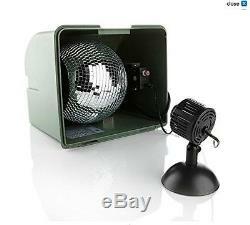 In the box: weather-resistant housing, reflective "snowball", LED spot lamp, motor, plug, and power converter New features: New Weather Proof LED Technology On / Off Control Upgraded Speed Dial Reinforced Steel Hinges Dust-Proof Packaging New 3M Reinforced Mirror Ball. Falling Snow Flakes Light Projector Features. Amazing Christmas Outdoor Light Show. No Tools Needed to install. Snow'falls' up to 40 feet high and 60 feet wide. Adjustable Size and speed of snowflakes. 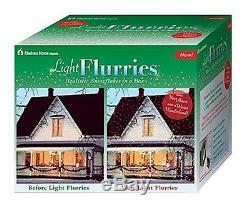 Light Flurries creates the magic of falling snow flurries in any climate! All items are in stock when they are listed. Must be an authorized address for this. Falling Snow Flakes Light Projector. The item "Falling Snow Flakes Light Projector Led Flurries Outdoor Christmas Show Decor" is in sale since Thursday, December 1, 2016. This item is in the category "Home & Garden\Holiday & Seasonal Décor\Christmas & Winter\Lights". The seller is "smartems" and is located in Long Island City, New York.